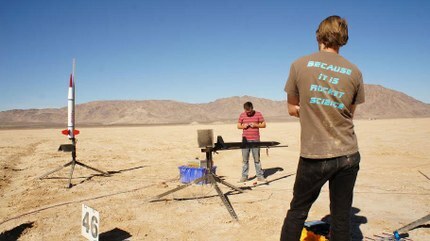 Safely away from populated areas and air traffic lanes, hundreds of people gather on a dry lake in the Mojave to launch homebuilt rockets thousands of feet into the sky. Suddenly the silence is broken by the whoosh of a rocket produced by an amateur rocketeer, one of many who are part hobbyists, part sportsmen, part grownups fulfilling the wishes of childhood – from individuals bitten by the rocketry bug as kids watching the glory days of NASA on television to real-life rocket scientists who just don't seem to get enough of rockets while on the job. 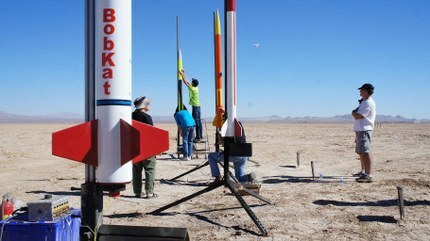 KCRW’s Saul Gonzalez recently visited Rocstock, one of the largest gatherings of rocketry groups in the country, put on by the Rocketry Organization of California. You can see more photos and video of a rocket launch on our Which Way, LA? blog.